CR-V drivers complain Honda hasn't let customers know about free repairs for vibration issues. February 10, 2019 — A 2015 Honda CR-V vibration lawsuit settlement has been approved by a federal judge after owners claimed their SUVs just about vibrated them off the roads. The lawsuit includes all entities and persons in the U.S. and Puerto Rico who own or lease a 2015 Honda CR-V. The CR-V consolidated class action arose from at least 10 lawsuits that allege the 2015 CR-V vibration problems were introduced soon after the vehicles went on sale. Before any lawsuit was filed, Honda posted a video on YouTube describing the vibration problems and informing owners the automaker was working on a fix. Shortly after Honda posted the video that acknowledged a problem, attorneys started filing class action lawsuits in several states against the automaker. Honda then issued technical service bulletins (TSBs) to dealerships with instructions about how to fix the vibration problems. 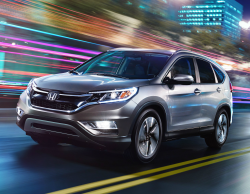 The first TSB was issued in August 2015 for CR-V customers who complained about vibrations at high speeds. A few months later the automaker issued technical service bulletin 15-046 to repair all instances of CR-V vibrations. The plaintiffs admit Honda has offered free repairs since 2015, but the plaintiffs claim Honda allegedly "has not publicized the availability of these repairs." The final settlement terms don't provide anything to CR-V customers beyond what Honda has already been offering in earlier technical service bulletins. However, the settlement mandates that Honda contact all affected 2015 CR-V customers that vibration repairs are available for free. Attorneys for the plaintiffs have requested $1,368,774.08 in fees and expense reimbursements. The 2015 Honda CR-V vibration lawsuit settlement was finalized in the U.S. District Court for the Southern District of Ohio - In re: American Honda Motor Co., Inc., CR-V Vibration Marketing and Sales Practices Litigation. The plaintiffs are represented by the Gibbs Law Group, and Isaac Wiles Burkholder & Teetor.